In the realm of adventure travelling, participants have to come up with more and more peculiar trips to attract attention (just check out my review of “Journey to the Centre of the Earth”) or to make a statement. I recently attended a talk by one adventurer who ran across the Sahara Dessert (7,000 kms in 110 days) to draw attention to the region’s water crisis. The idea of having two showers in nearly four months was not appealing to me, but how about a nice holiday to visit the family? A young Canadian couple, Colin and Julie Angus, decided to do just that. His relatives live on the windswept islands off the coast of Scotland, while her mother is from Germany and father from Syria. Linking these places together would not normally be all that difficult but this is not a normal couple. 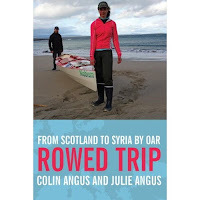 Colin was, among other adventures, the first person to circumnavigate the world on human power alone, and Julie was the first woman to row the Atlantic, so just getting on a plane and do some short flights was not going to work. Instead they realized that to a large extent you can make your way across Europe by boat by using open waterways, rivers and canals. But the difficulty is in the portages necessary to get from one canal to another. The answer, of course, is riding bicycles and towing the boats. This, obviously, presents some logistical challenges as to how to haul the boats and what you do with the bicycles and trailers once you reach your canal. Colin and Julie are clearly the kind of people who relish these kind of challenges. They came up with special lightweight trailers that could be easily dismantled, and of course finding a folding bike is not too difficult. Although they do not refer much to the bicycles, which are clearly tools secondary to the boats, the photographs indicate that they used Montague folding bicycles, which are well-designed full-sized mountain-type bicycles, sturdy--and pretty heavy. They soon came to realize that there were no boats on the market that would meet their requirements for seaworthiness, speed and storage of the bicycles and trailers onboard so having no experience in boatbuilding they built a pair of rowboats. Named for two minerals produced by Commerce Resources, a key sponsor, Tantalum and Niobium looked like broadened sea kayaks and were built with the stitch-and-glue technique used for making wooden sea kayaks. I found this particularly interesting as I actually have had a set of plans for a 17 foot kayak to be built in this way for years but my lack of mechanical skill has always made me hesitant to build it. The Anguses, on the other hand, spent only a year in preparation for the trip all told. Leaving Scotland on a cold windy day on March 9, 2008, they begin by towing the boats and would continue to do so until reaching suitable water five days later. I, for one, would have liked to have been present when the bikes and trailers were folded up and the whole circus transformed into two decked rowboats. Or when they landed somewhere and did the process in reverse. As well, the two boats could be joined up to form a catamaran with a deck where their tent could be erected if there were no camping spots to be easily found. The book is highly entertaining as Colin and Julie alternate in the telling of the story. From intransigent and useless Scottish lockkeepers, to the enchanting Oxford Canal, to floating overnight near the Hammersmith Bridge on the Thames in the heart of London, you will find the couple excellent company. 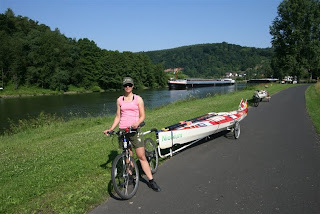 Their route took them across the English Channel and after suffering through the industrial canals of northern France (and having one of their custom-built boat trailers stolen, of all things) they reach Alsace and Germany, where paddlecraft are actually catered-to by having their own access through locks. They even rode along two of the nicest bike routes in Germany, through the Altmuhl and Tauber valleys, that I have ridden myself. But the real drama heart of the story is their cruise along the mighty Danube, which is not blue in the least, but as they head into Eastern Europe becomes polluted and dangerous. The irony, of course, is that the canals that made their trip possible marked the beginnings of the industrialization of Europe, with all its social and environmental effects. From orderly Germany and Austria, they find points east more difficult. 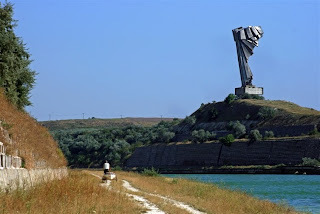 Although they write that Serbia was one of their favourite spots on the trip, it is regretted that they do not explain why this is since the countries around them, particularly Romania, sound pretty awful. In fact, the nastiest part of the trip, besides the places where they run into bad weather that actually sounds quite risky, is when they reach Romania’s frightening so-called (with good reason) Death Canal. This is more of an obstacle than a highway for them but eventually they reach the Black Sea. Leaving their boats for shipment back to Vancouver via Turkey, they cycled the final portion of the trip, arriving at their final destination, Aleppo in Syria, on September 18, 2008. They had journeyed a total of 7150 kms, probably using their bicycles more than they had expected. The expedition was followed on-line by schoolchildren, who asked questions and made suggestions about the trip. There is interesting social commentary, along with a fair amount of history, in the account, alongside stories of the struggles involved in moving onwards. The book includes appendices with distances covered, tips on kayaking or canoeing in the countries the Anguses visited, and even a chapter on how to build a rowboat in your backyard. For a wonderful slideshow of the trip, go here. 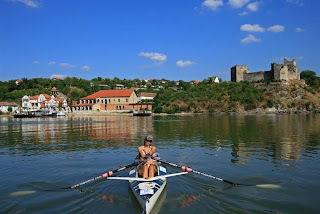 They have several websites devoted to their travels, including the Rowed Trip online journal. Julie and Colin Angus are now undertaking a 21 city tour to promote the book and I will see them speak in Ottawa on November 19. Their final stop will be in Washington, DC, where they will speak at the National Geographic Society, the organization that named them “Adventurers of the Year” in 2006 on November 24. I am looking forward to their presentation and learning how they found adventure in a part of the world that might be considered more prosaic than, say, the high Arctic or Mongolia. I supplied the folding bikes for Colin and Julie and can confirm that these were made by Montague. The custom trailers were built by former Tour d'France rider Tony Hoar. The reason the Montague logo was not visible on either bike is because Colin & Julie wanted to honor the contributor rather than the manufacturer. Colin had asked that I provide a logo but I could not get that to them in time. If you happen to meet them, please say hello for me. They're an incredible duo. Hi, Larry and thanks for the info. I have my ticket for November 19 and will pass on the greeting. As a cycling guy, I would have liked more info on the cycling equipment but as I gather from the book and your blog everything worked pretty well on the roads. I knew the bikes were up to the task but I was concerned whether the full size folding bikes would fit in the cargo holds. Colin had taken careful measurements of the hold and the hatch and was confident it would work so I sent the bikes. As you read, it all worked out quite well. The only issue was with UK customs. The boats and bikes were shipped ahead so the customs authorities were arguing that duties would apply. Fortunately, the authorities waived the duties and the expedition proceeded. Leslie, I love your book review and I must pick this one up, thank you. I attend the presentation at the library on November 19 and had my book signed. The place was packed to the rafters!